Corsair AF120 Performance Edition Twin Pack. Performs at 1650rpm, 63.47cfm airflow, 1.1mm/H2O static pressure and 30dBA operating volume. 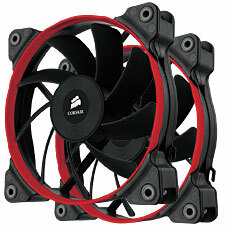 The Corsair Airflow series is designed for maximum airflow performance to keep cool air flowing through your case. Designed to operate with 30mm of space to draw air from, the Corsair AF120 is a great solution to keep air flowing over your hard drives, graphics cards or CPU cooler. Includes 3 different colour trim inserts, mounting screws, voltage stepdown adapter and 3pin fan connector. Backed by a 2 year warranty.